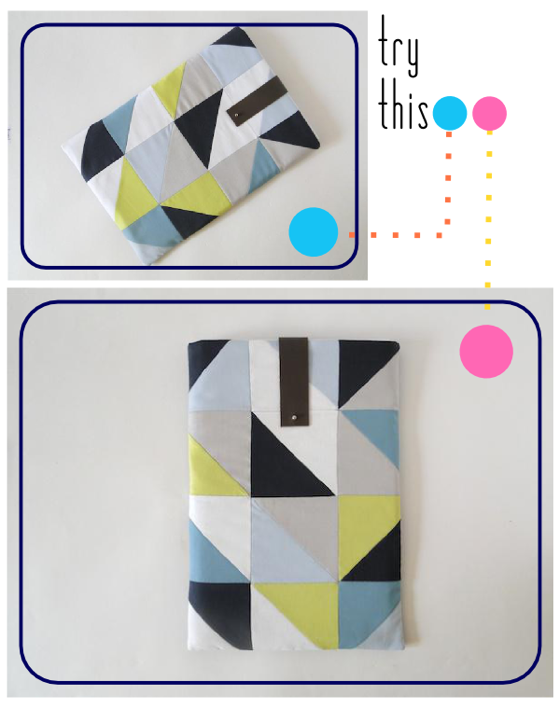 While not my taste in colour schemes, this laptop sleeve tutorial is definitely a good starting point for how to make a cool designs for a laptop sleeve. I imagine I’d want something in the blue/black palette to suit my tasts. But that’s just me. You might recall that I got a MacBook for my birthday. Upon the death of my husband’s PC last week, I convinced him to come over to the Apple side. Because he’s a lovely man, he thought we should get a bigger one this time around and that said bigger one should become mine. So this put me in the market for another laptop sleeve. I decided to go a different route this time around (see my last creation here), and make a tutorial of it. If you’ve checked out any of my tote tutorials, these steps will seem familiar. This time around, I added in some basic quilt-piecing skills to create a sleek geometric pattern, which was super inspired by some of Ferm Living’s latest textiles but particularly this pillow.